Bookit Vacation Rental Manager is a full-featured property management tool designed to automate many property management tasks. Bookit is a platform independent web based application that runs on any web server. Your private copy of Bookit can be installed on any web site that supports PHP. We can host your copy of Bookit on your secure web servers if you do not have your own hosted web site. 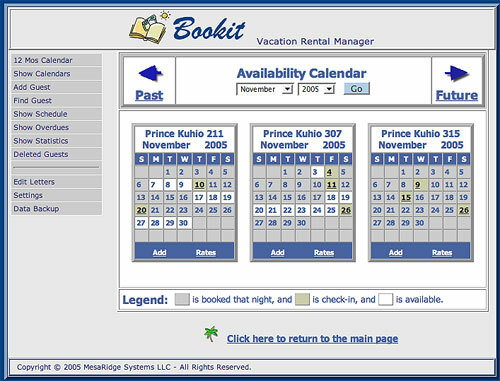 Bookit comes with an availability calendar that is automatically updated with each new guest booking. The calendar shows available dates, booked dates, and check-in dates for each booking for each property by month. The availability calendar can be displayed from any of your website pages or included as a link in an email to prospective guests. The availability calendar can be displayed with every property for a single month or it can show a single property for 12 months. 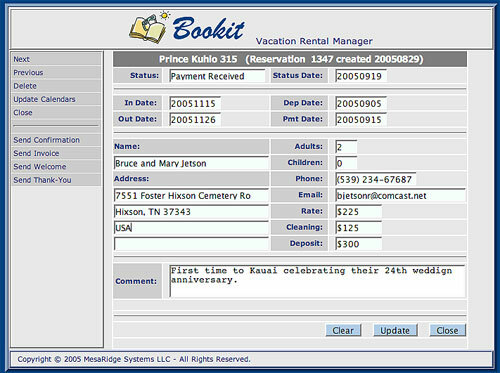 Add guest bookings directly from the Bookit interface by entering pertinent guest information. The information is then saved securely on the server. New bookings are displayed immediately on the availability calendar which is automatically displayed after entering a new reservation. Easily add guest information using a form with fields that are easy to navigate. Don't worry about making mistakes because the form is validated for common data entry errors. After you create a guest entry in the system, you can always go back to that entry and make changes. Sometimes reservation get cancelled. You can delete a booking and it will go into another area so that you can call up old deleted entries if necessary. Guest entry data can be accessed in many ways. The most common is by clicking on the check-in date from the availability calendar or by clicking on the guest name in schedules and reports. After entering guest information, select a menu item to automatically compose an email from a template and send a confirmation to the guest. The confirmation template can state policy and booking dates, rates, deposits and more. You can customize the confirmation email template. After receiving guest deposit, select the menu item to automatically generate an invoice statement letter and email it with an email message to the guest confirming deposit received. The email can provide a link to the invoice that was created and stored on your site for that guest. After receiving guest payment, select the menu item to automatically generate a welcome letter and email it with an email message to the guest finalizing the reservation. The email can provide a link to the letter that was created and stored on your site for that guest. The welcome letter can contain arrival information, condo and shopping details, maps and keys. After guest departure, select the menu item to automatically generate a refund letter. Print the letter and send it with refunded depoist. Use Bookit to guard against booking identical dates or dates that overlap and to keep tract of management process status for each guest. Some words about customizing letters and the types of letters. Some words about customizing emails and the types of emails. Use Bookit to generate a schedule for each property for a range of dates. Give your housekeeper a link to the schedule page so they can see the latest schedule at their convenience. Easily search Bookit for a guest name and see the booking details for that guest. Use Bookit to automatically scan all your bookings and generate a report of the overdue deposits, payments or refunds. ©2001 - 2003 MesaRidge Systems LLC. All Rights Reserved.